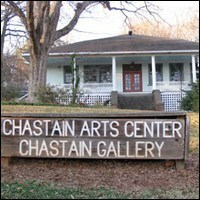 Chastain Arts Center has provided exceptional art classes and exhibits for over 35 years, making it one of Atlanta's oldest community arts centers. There are classes for all ages and for all skill levels in a variety of fine arts and crafts. There are four sessions each year, with classes that usually last for ten weeks. Many shorter workshops are also offered. Exhibits in the adjacent Gallery and throughout the Center showcase both the work of outside artists, and artwork created by instructors and students. The Center is located in Chastain Park in northwest Atlanta.